Arriving in Qatar one is confronted by desert stretching in all directions, a seemingly lifeless landscape of low, barren sand plains and rolling dunes. Within this desolateness however are signs of life and things of delicate beauty which Al-Thani – who has perhaps examined the Qatari landscape more closely than any other photographer – reveals for the first time to an international audience. The photos in Here is My Secret were taken in November and December 2008, and January and February 2009, when Al-Thani traversed Qatar, his only companions a Toyota four-wheel drive and his Leica camera. Eschewing the changes humans are impacting on the landscape, Al-Thani focuses on the humble, poetic details of nature: a lone tree, a herd of gazelles, a resting falcon. Qatar is a land in flux that gained its independence only in 1971 and has since prospered due to rich oil and natural gas reserves. In response to this financial growth, a scientific, social and cultural transformation is underway: important projects to date include the establishment of the Qatar Philharmonic Orchestra, I.M. Pei’s Museum of Islamic Art and the Doha Cultural Festival. 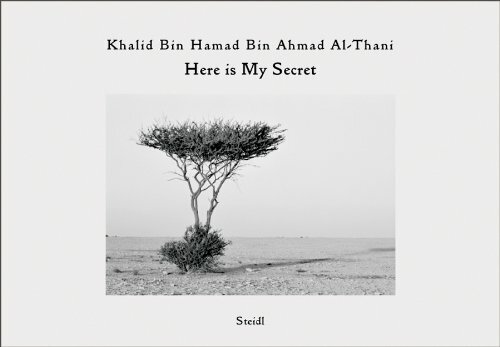 Here is My Secret will be released for the 2009 festival, both in book form and as an elaborate exhibition of platinum prints.